As faculty and staff, you may come into contact with students who are struggling and/or in need of extra assistance. There are many reasons why students may be struggling or in distress, including relationship difficulties, stress, physical or mental health issues, academic challenges, or financial problems. Students may provide a number of signs that they are having difficulty. Being aware of these signals, as well as resources to help, plays an important role in supporting student success at the University of Illinois at Urbana-Champaign. We have designed several resources, materials, presentations, and trainings, specifically for faculty and instructors. The Student Assistance Center in the Office of the Dean of Students offers presentations and specialized trainings to students, faculty, and staff on a variety of issues impacting students’ lives. Please review our available presentations (pdf) and visit the link below to submit a request for a presentation. Please understand that while we will make every effort to meet your requests, we may have a high volume of requests and/or student need at certain times of the year. To make the best use of our services, we generally request at least 15 people and a minimum of 30 minutes with your group. If you have any questions or concerns, please let us know! The Student Assistance Center in the Office of the Dean of Students offers brochures and magnets on a variety of our programs and services. To request materials for your office or class, please complete the information at the link below at least one week before you would like to have the requested items. Please understand that certain times of the year may result in a large volume of requests for materials. We will do our best to accommodate your request. Students face a number of challenges throughout their academic life here at Illinois, which include increased responsibility, academic and personal stress, complex relationships, drugs and alcohol, and emerging psychological difficulty. It is our hope that you, as a faculty member, will recognize some basic signs of distress and respond with care, concern, and support. This resource outlines campus support services, signs of distress, and practical ways you can intervene to support a student in distress. Classroom disruptions can be signs of a student in distress, or acts of ignorance and disrespect that indicate a student is now aware of the impact their behavior has on the broader classroom environment. Common examples include students who persistently arrive late to class in a disruptive manner, loudly and frequently interrupts class, or responds inappropriately to the professor or peers. The resource outlines three levels of responding to such behavior, with suggested action steps and offices to consult along the way. The Center for Innovation in Teaching & Learning provides several wonderful teaching and learning resources to assist faculty and staff who manage courses. In particular, you may find their information on creating a syllabus and teaching in specific contexts to be useful as you plan for your courses each semester. Because students may not always be eligible to obtain an absence letter for a missed class/classes, this resource is intended to provide example course policies regarding such instances. Because students may not always be eligible to obtain an absence letter for a missed exam, this resource is intended to provide example course policies regarding such instances. It is not an exhaustive list, and is simply a resource of examples from your academic colleagues across the country who also must manage student absences from tests/exams. We recognize that it can sometimes be difficult to support students in your class, particularly when you have several hundred students per section! However, sometimes all it takes is a small effort, and including information about support in your syllabus is one way to do this. Below we have included some syllabus language that outlines support resources on campus, and encourages students to refer others or themselves when they notice behavior that worries them. We would appreciate if you consider using this language in your syllabus, and when communicating with students about your expectations for the classroom setting. Please help us promote a caring campus community by providing critical information and resources to your students. The University of Illinois expects and encourages students to maintain a reasonable concern for their own self-welfare. One of the times the University formally requires that such a concern be maintained is in the area of suicide. The University of Illinois Suicide Prevention Team coordinates the timely response, intervention, and support to students who are engaging in suicidal behavior in order to facilitate a safe, respectful, and productive educational environment for all students. In the event that the University is presented with a credible report that a student has threatened or attempted suicide, engaged in efforts to prepare to commit suicide or expressed a preoccupation with suicide, that student will be required to attend four sessions of professional assessment. The purpose of this assessment is to provide the student with resources to adhere to this standard in the future and to monitor the student’s willingness and ability to adhere to this standard. The University of Illinois community cares about the well being of every student. 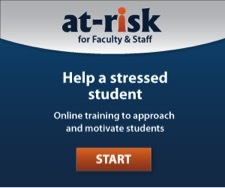 To ensure that students who are distressed get the support they need, the University of Illinois Counseling Center has partnered with Kognito At-Risk to provide online training simulations. We hope that each faculty/staff member and each student will participate in this Kognito At-Risk training, which will help you to better identify, support, and connect distressed students with campus services. Kognito At-Risk has the feel of a video game as you make choices about what to say and do in conversations with students who may be distressed. It takes just 30-40 minutes to complete. Choose from faculty/staff or student modules. There are also specific modules for reaching out to students who are military veterans and those who identify as transgender. Identify students who are at risk for suicide. Motivate distressed students to seek help. Put students in touch with support services. Outreach and prevention services include providing consultation services to academic and other student service units across campus. The Counseling Center has worked to establish strong relationships across various units on campus. Currently we provide direct liaison services to the College of Engineering, College of Liberal Arts and Sciences, the Graduate College, and all cultural centers on campus. Our clinical staff also provides services to family housing and campus housing. The liaison service provides clinical consultation to students within the units and/or develops programming designed to meet their psychological and developmental needs. If you would like to access liaison services, please contact the appropriate staff member listed here. What happens when I refer a student? Often, the first step following a referral is for SAC staff to contact you to gather additional information. This can help to provide additional useful context for the behavior, and ultimately helps SAC staff determine the most appropriate way to follow-up with the student. SAC staff will also provide you with resources and strategies for working with the student and managing the situation. What happens next depends on the behaviors described, the urgency of the situation, and other information we may know about the student. In some cases, it may be best for you to follow-up directly with the student to outline your concerns. In other cases, SAC staff may reach out. We will talk with you about all of the possible steps. Can I make a confidential referral? Many people are concerned that students will be upset when learning that they were referred to our office. In most cases, students are very appreciative that someone has expressed a concern; they understand that the referral was because someone cares about their health, wellness, and success at Illinois. It is difficult to share concerns with a student about their behavior without sharing the source of that information. Additionally, students may have only behaved this way in one setting, or shared certain information once, which makes it easy for them to determine the reporting party. If you have specific concerns about making a referral and how your name may be used, please contact us before you submit a referral. We can be reached at (217) 333-0050. I have a student being disruptive during class. Can I have them removed from my section? Many classroom disruptions, such as consistently arriving late to class or leaving early, interrupting the lecture at inappropriate times, and inappropriate use of technology, food, or drink, are examples of disrespectful behavior that are not indicative of a broader concern. In these cases, we recommend that you share your concerns with the student in a private setting. This also provides you with an opportunity to talk with the student about whether or not they would benefit from additional support or resources. Learn more about how to manage classroom disruptions (pdf). What do I do if a student is missing or I cannot get in touch with them? Sometimes it is difficult if students are missing or simply voluntarily non-communicative. Students are adults, and able to make independent decisions regarding their attendance and assignments. If you are concerned about the well-being of a student who has not responded to your efforts at contacting him/her, but you do not believe it is an emergency, you can call the main Student Assistance Center line at (217) 333-0050 during business hours, or UIPD after hours at (217) 333-1216. We will put systems in place to attempt to contact your student, inform him/her of your concern, and ask that he/she contact you. If a student has been missing for over 24 hours or you have other reasons to be immediately concerned about a student, please contact UIPD at (217) 333-1216 or 911. In either type of situation, after the student has been located, the Student Assistance Center will work with that student to coordinate any longer term medical or academic care to work to prevent a similar situation from arising.